Welcome to the parish of Mary, Mother of Mercy! Welcome to the web page for the newly formed parish of Mary, Mother of Mercy. This new parish has three churches: Holy Cross in Ovid, New York; St. Francis Solanus in Interlaken, New York; and St. James the Apostle in Trumansburg, New York. 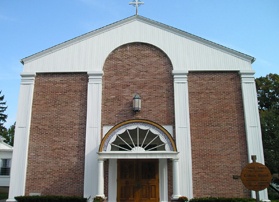 The parish office is located at the Parish Center: 3660 Orchard St., Interlaken, NY. The title Mother of Mercy is thought to have been first given to Blessed Virgin Mary by St. Odo (d.942), Abbot of Cluny. It is a fitting title of Our Lady both because she brought forth for us Jesus, the Christ, the visible manifestation of the mercy of the invisible God, and because she is the spiritual mother of the faithful, full of grace and mercy. Please join us in faith and in person at any of our three churches. Our mass schedule is listed below and additional resources are available on subsequent pages. To join the parish community or to celebrate the sacraments of baptism, confirmation, anointing of the sick, or marriage, please phone the Parish Center (607 294–0064) to make arrangements. • St. James the Apostle, Trumansburg: Communion service on Monday at 9:00 a.m. and Mass Tuesday through Friday at 9:00 a.m.
• St. Francis Solanus in Interlaken: Mass on Wednesday at 9:00 a.m.
Saturdays, 3:30–4:30 p.m. at St. James the Apostle in Trumansburg or by appointment with a priest.